The Clos Häuserer is located just below the limit of the Grand Cru Hengst. This wine was actually labelled as Riesling Grand Cru in the late 70s! The delimitation was correct because the Clos Häuserer has a deeper, richer soil than Hengst. It takes about 1 to 1.2 metre to find the calcareous mother rock. This depth brings lots of interesting minerals to the wine and a very balanced water supply. Until the vines reached about 20 years old, it was difficult to obtain a balanced vigour in this rich soil in order to bring the yields down. The Clos Häuserer has a cooler soil, due to its higher marl content, so the Riesling grape takes longer to ripen there and can keep a high acidity. In 2010, unfortunately, we lost about 40% of the crop due to a severe hail early July. The clusters were still very small and fragile, so each impact would cut off the whole cluster or part of it. The good weather allowed for the vines to recover quickly without diseases and the harvest, very healthy, was done at normal time, unfortunately too quickly. Fermentation was very slow and the yeast kept little residual sweetness. 3/2012: this wine is starting to express some beautiful stony, mineral aromas. It will take probably a year after the bottling for the fruity character to eventually come out. The palate shows a firm crisp minerality with a long aftertaste. 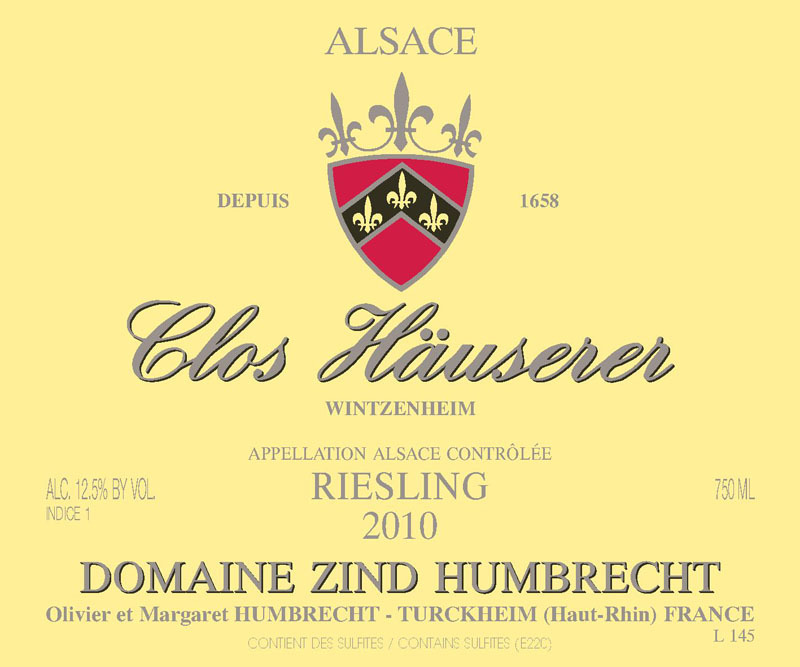 The Clos Häuserer is a very elegant wine in 2010 with a medium alcohol power. The little residual sweetness brings a small sensation of roundness which is very short, because the firm acidity makes the finish taste dry. This is a true Indice 1 wine!